I was fortunate to win a couple of lots at the Christie's and just received my winnings today. 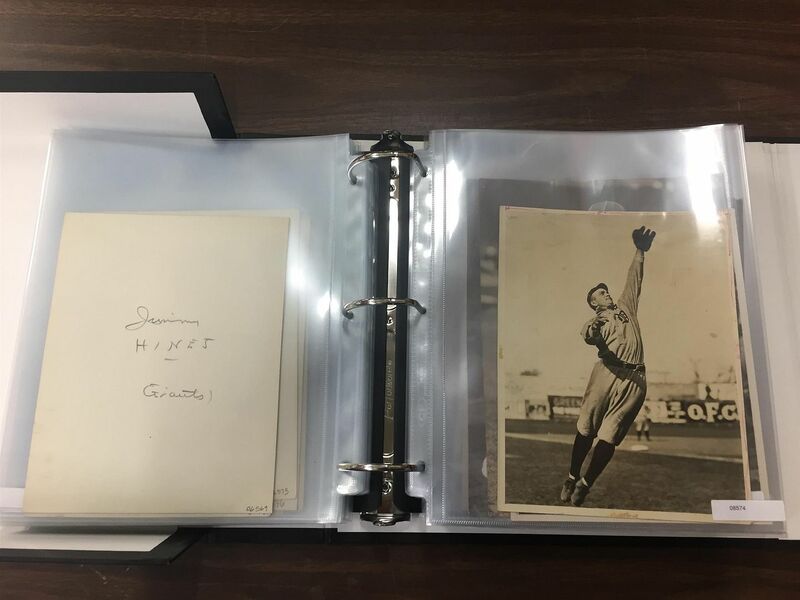 I had requested access to several lots, so I knew what was there, but I was stunned at the sheer volume of magnificent images buried within 75 photo lots with only a handful of the images actually posted publicly in the auction listing. So, I'm starting this thread to post your "Buried Treasure, photos that were not publicly shown in the listing images. Please share yours, but "buried treasure" only! Here is one of mine. It comes from lot 210 and is one of my very favorite Bender images. I have been searching for this exact copy for years. It was my photographic White Whale! It was last seen in a Legendary Auction some years back. If anyone has a copy of the catalog with that listing I'd appreciate a shot of the listing as I could have sworn it mentioned Paul Thompson. In any event, post away, I doubt we will discover such buried treasure in any other auction anytime soon. I will post more images in a few days, but suffice it to say, as a buyer, I am thrilled with Christie's. this is the description when legendary auctioned it, in december 2009. it sold for $2,370. Original Thompson writing, American Press Association Stamp Authenticated by PSA; Full PSA letter accompanies. Thanks Ronnie, great information! The PSA letter is no longer with it, anyone had any luck back tracing a cert # from PSA to view the letter online? 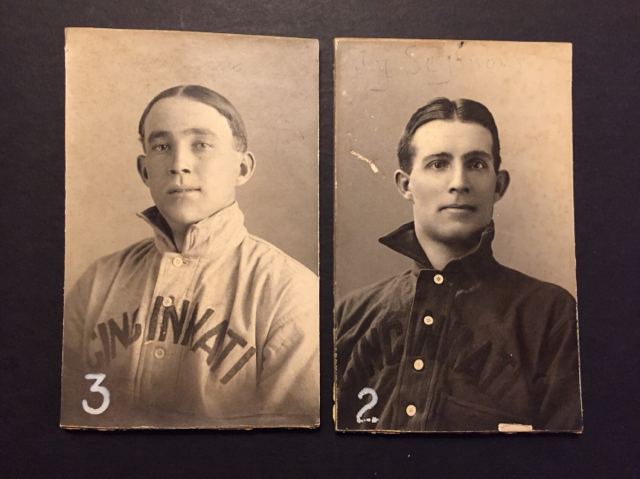 I won only one photo lot (a team photo lot), but won several more lots, including the Coveleski and Wilmer Fields lots. I have no clue what is all in them, I bid just judging by the writeups and what I saw in the photo provided. I am still waiting for my winnings to arrive. I got a suspicion that the Fields lot is going to be filled with treasures. 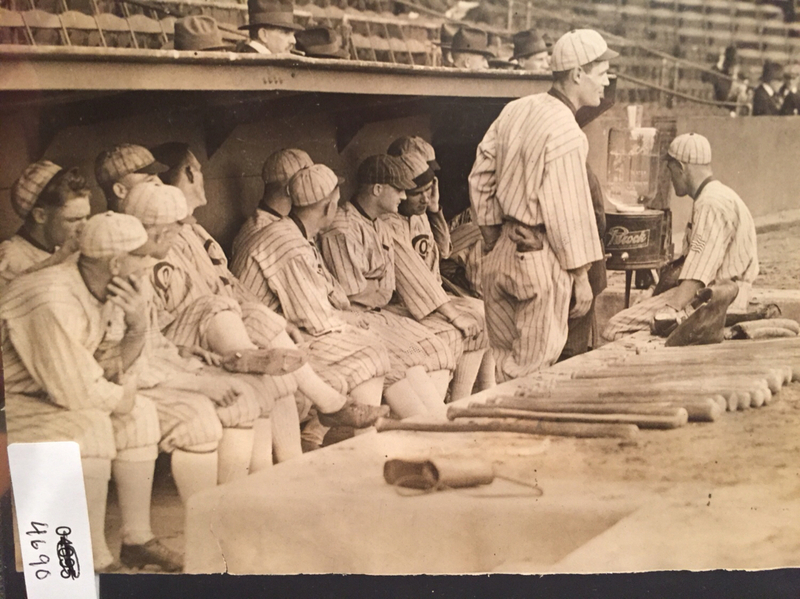 I posted a thread in this section several days ago regarding a Ty Cobb photo in one of the lots that I won. The photo is very clear and almost certainly from the original negative. Only question to me is whether a type one or type two. If it turns out to be a type one (which I have a feeling that it is), I will be more than a little bit happy. 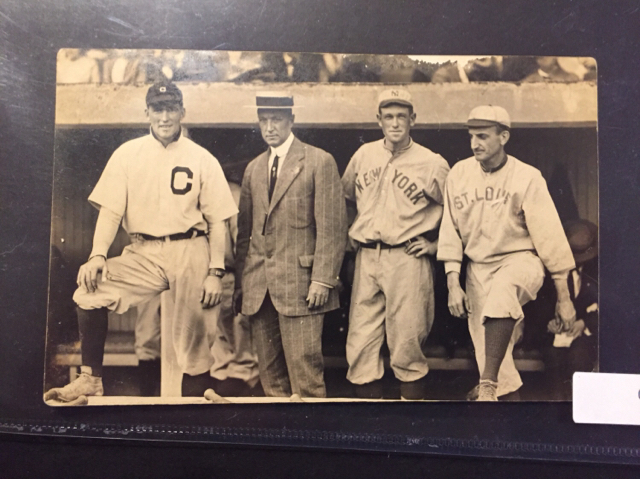 A Ty Cobb full size type one with full borders dated to 1907 by Cahrles Conlon? Yes please! Was not photographed or even mentioned in the write up. Wow Andrew, that's a really nice one! This one was buried in my binder. I love all the markings. Feels like an artistic creation. Thanks, Gary :cool: . Scan really doesn't do it justice. In-person it's a stunner. Think I've got a shot on my phone from when I visited. Will post. Is it safe to say that christie’s did not do their due diligence for their consignor? Wow, is that ever an under-statement! I checked out the catalog but did not have the guts to bid on anything. One box held three box binders, the other held two box binders. Those binders were in a smaller box, surrounded with packing peanuts, inside the boxes you see there. Also, each binder box was wrapped in plastic and secured with tape. Maximum overkill. Now I know why I paid over $500 for shipping!!!! Best have a sharp blade handy once they arrive. Lots of hacking and slashing in your future. I'd be interested to see any Pirates photos from any of the lots, including the team lots. Now I get why he was called Highpockets. That never clicked until just now. 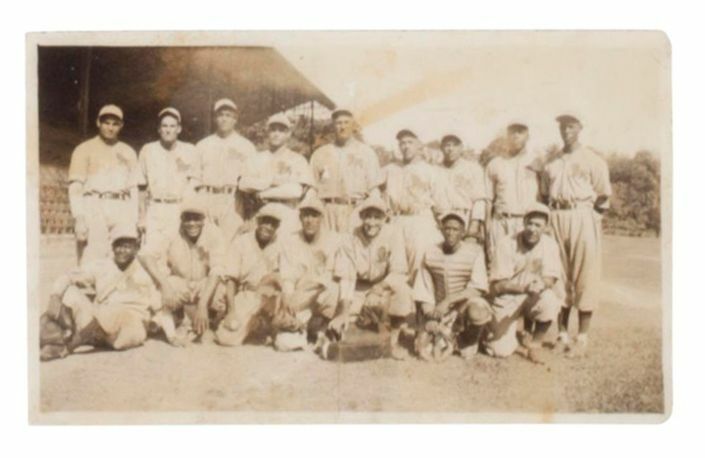 "Home Run" is an apt moniker for this gem from lot 53. Very nice! Is there a news service stamp on the back? Yes it is a double weight Underwood. How cow Jim, that Bender photo is out of this world. Congrats! Great picture! I would enjoy seeing Kriendler tackle that one. 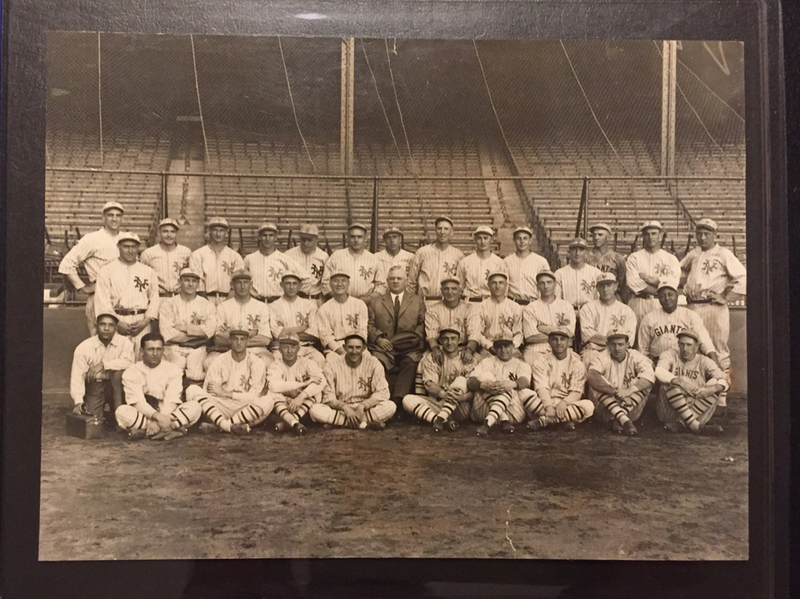 5x7 Thorne Yankees team photo. This came out of the Coveleski photo album. 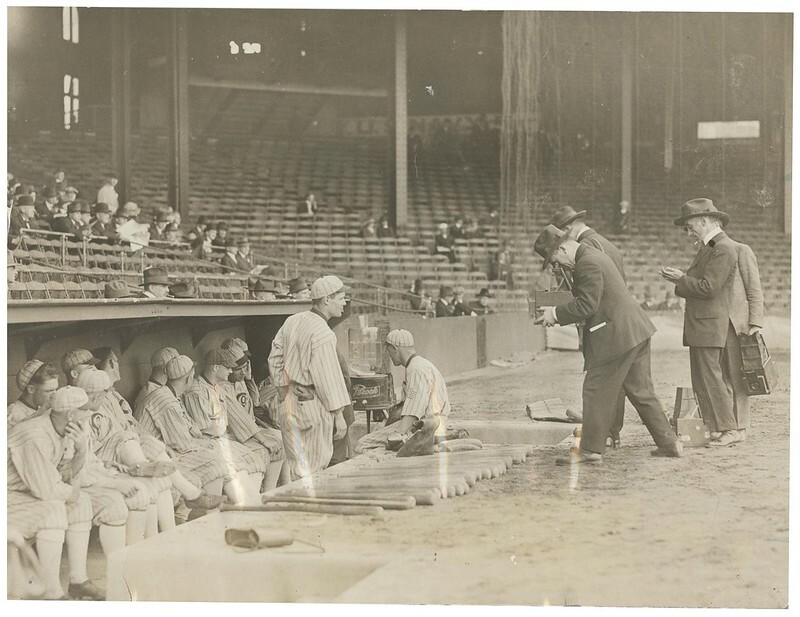 I assume that this is the 1928 season since that was Coveleski's lone season with them. I guess I need to start paying attention to Christie’s now. I remember the good old days of Hunt auction lots where you didn’t know exactly what you were getting in a lot until it showed up on your doorstep. Packages came today. Two huge boxes, one box held the framed and matted Puerto Rican league whiskey display piece. The other box held all the other lots I won. 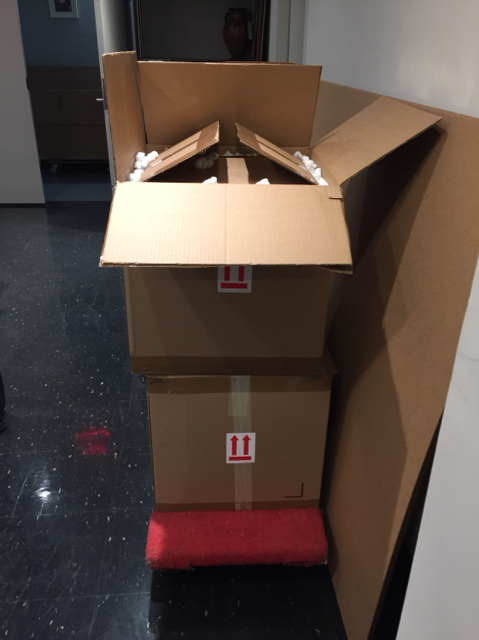 Those lots were individually boxed in two boxes per lot, really. At least I got a boatload of packaging supplies to reuse! I appreciate the time and effort that they used to package my items, but wow. I have been buying from online auctions for close to 20 or so years now, and I never saw so much precaution take in shipping items. The shipping cost for the lots I won was over $500, which was more than 10% of my costs of the lots I won. There are still some other auction houses where you can luck out still in terms of bidding on bulk lots and being surprised when it comes to your doorstep. Lelands used to be like that back in the day, too. I remember purchasing fantastic autograph lots back in the 00s in Lelands. One vintage Yankees lot I purchased had two signatures each of former owners Devery and Farrell, and those weren't listed or shown. Another autograph lot I purchased about 15 or so years ago had the very tough Andy Varga on a vintage RPPC. Again, not even mentioned in the auction listing. I don't think any AH will beat Hunt from the old days. They did partial descriptions and one picture for the entire lot. They almost always over achieved for their buyers as there were always additional items in the box. Tele Trade was another auction which will never be duplicated. Loved bidding by phone to a computor voice. Now to Christies. Here is what a 950.00 shipping charge gets you! A big box with lots of protection. Im sure Christies uses shipping and insurance as major profit centers for their company. Plus the 25 percent BP is pretty healthy too. It just amazes me that that half their descriptions, was warning people that they are not responsible for what type photo it is and no garuntee for being authentic. Lot descriptions were more disclaimers than actual product descriptions. Then they show one or a couple photos to show lots with up to 75 items. Yes, if you are in New York its a big advantage to show up to their location actually look at the items ahead of time But how many people actually did that? I was told over the phone they would get back to me, and that never happened. Plus I was told the lot I inquired about was in another warehouse. I think ALL winners should have their photos looked at, as rumorville has it there were many type 2s and later photos. 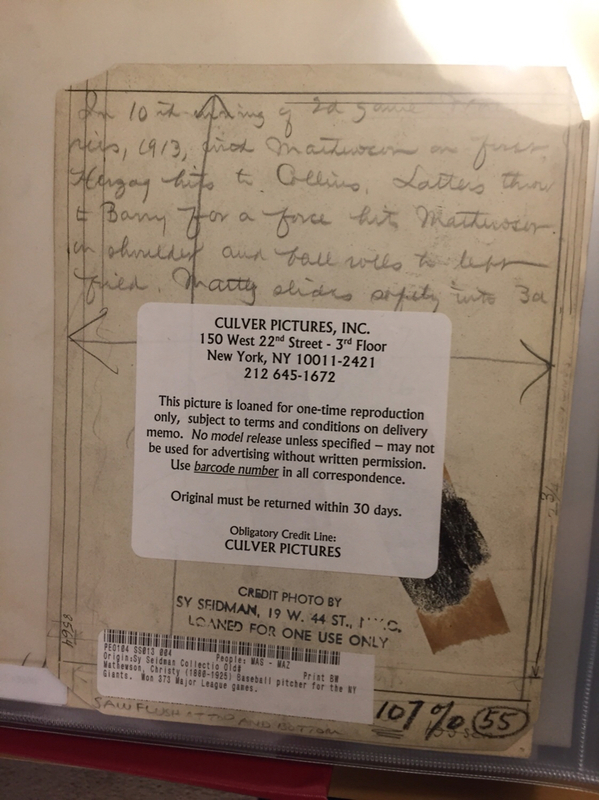 Interesting Christies nor the consignor wanted to Have photos graded by a TPG. Maybe two threads should be posted with one being success stories and burried treasure and the other thread being No treasure and a couple lumps of coal. OMG! Tele Trade! I remember bidding on their auctions via pay phone on my floor in the dorm building I lived in at Robert Morris! Fun memories! JC, I'd estimate out of the 150 photos in my lots approximately 10% where not Type 1s. Sometimes however the other types are much cooler! Check out this Lajoie. First is the base image. The second is the image with the floating head (a clearer image) attached (note the glue marks on the first image). The third shows both and the fourth is a published example of FrankenLajoie. This was photoshop circa 1910. A fascinating look at the editing craft. They indicated it was the last of the collection they had been consigned (the 3 auctions were all from a single consignor). I imagine if a similar situation came up they would do it again, but I would wonder why anyone would consign sports items to Christie's given the way these listings were handled. 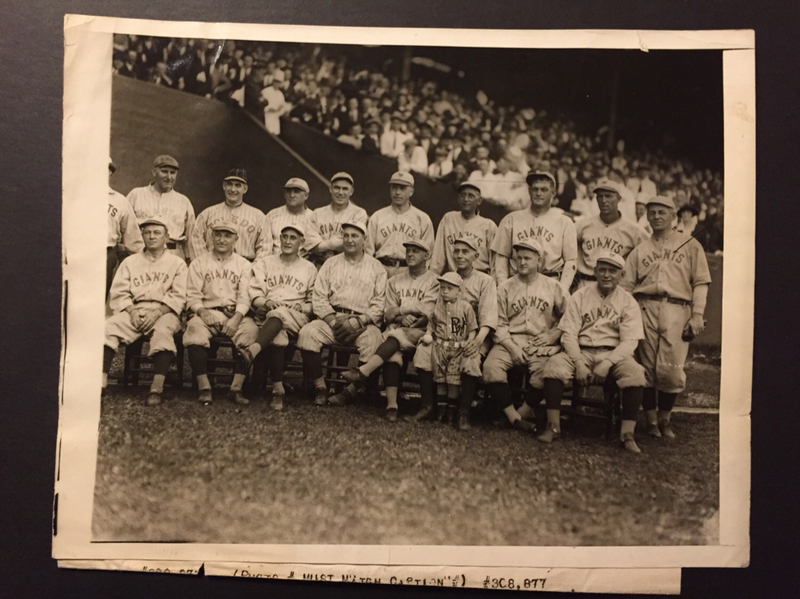 Clearly on the photographs they parsed out the Ruth Gehrig and Cobbs etc for the first two auctions and this was let’s sell what’s left. Quickly and in groups. Assume the consignor was fine that approach or he would have taken it elsewhere. Jim, thats good to hear and agreed the later types can be very cool, like the examples you showed. I take it you will be be reserching many photos now and the what issues they were used in. Jeff, I think the consignor must have had a relationship with Christies which would explain why they chose to go with an AH that did not do him any favors, on the way they sold off his consignments. Not too mention, the absorbiant fees they charge buyers. This could pave the way for future gazillionares, trust funds, buying groups, and Museums to consign a large 8 figure consignment to them. Im curious what percentage of the consignors portfolio was made up of the 3 Christies Sport auctions? I bet they also have some serious art, houses in every Continent, many high profile cars, vases from the Ming Dynasty, their own Island and possibly a ticket to go out in space! Im just glad they allowed the public to buy and enjoy their collection which they have amassed. Some big collections will never come to market. 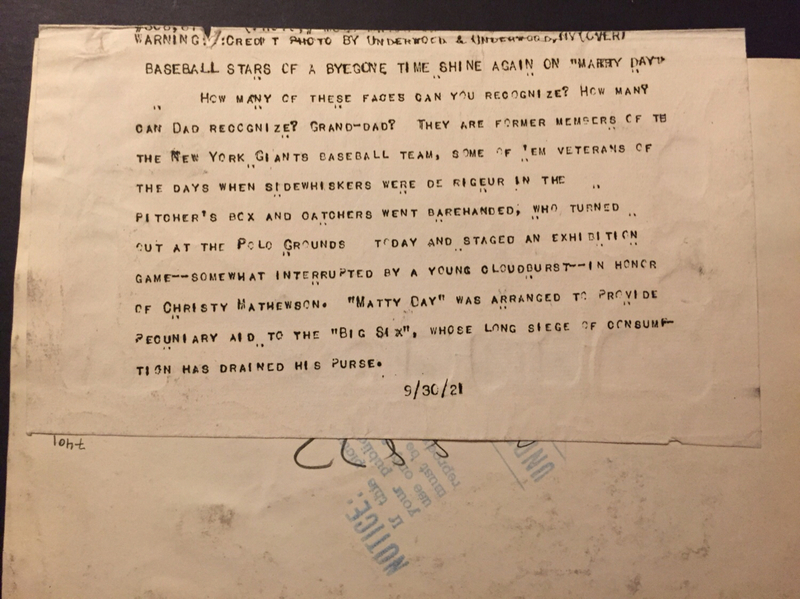 I was the underbidder on lot 153 (WALTER O’MALLEY LETTER REGARDING BROOKLYN DODGERS RELOCATION). I was prepared to bid higher, but sadly Christie’s outbid email never came through to me. If the winning bidder is on Net54, LMK if you are interested in making a fast, significant profit. Thanks! Conlon Waite Hoyt, used for 1933 Goudey card. 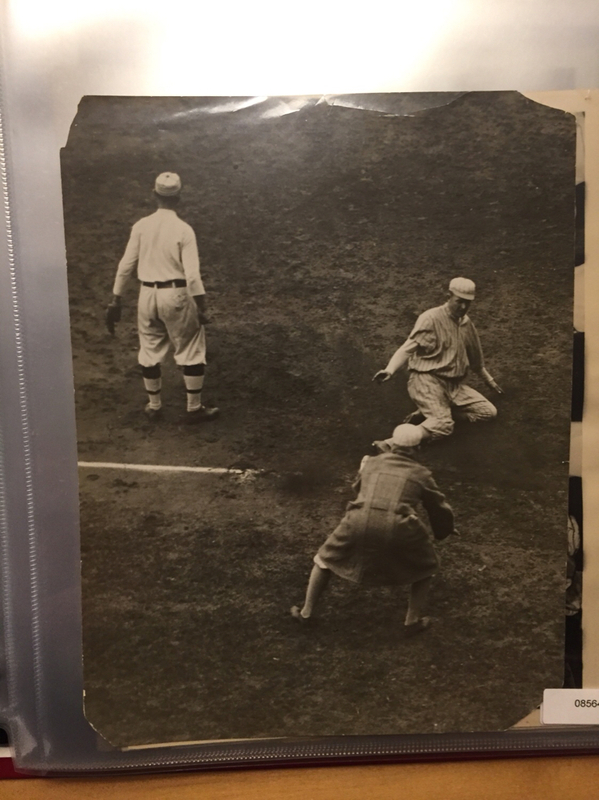 Conlon, 1913 World Series Game 1, Chief Bender running to cover third. Conlon Lefty Grove, used on a few odd cards. Not sideways of course. No hidden treasure but I certainly didn't get the pack job everyone else got . At least it wasn't damaged . Ronnie- they were actually pretty helpful...we discussed them reaching out to the winning bidder stating I’m interesting in acquiring the item. they said it would be between me and the buyer, Christie’s would only be putting us in touch (there’d be no cut for them), which I thought was good...so, fingers crossed I get a response. 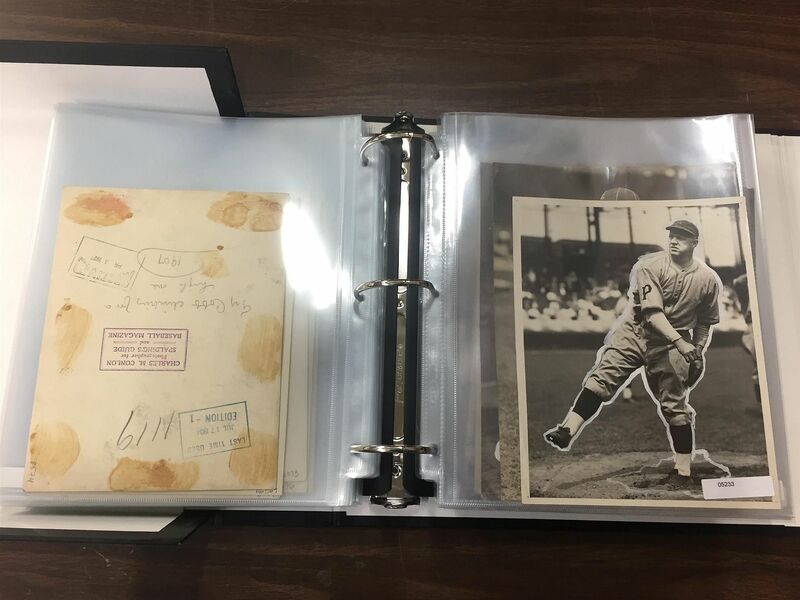 Some gems from Lot 90. 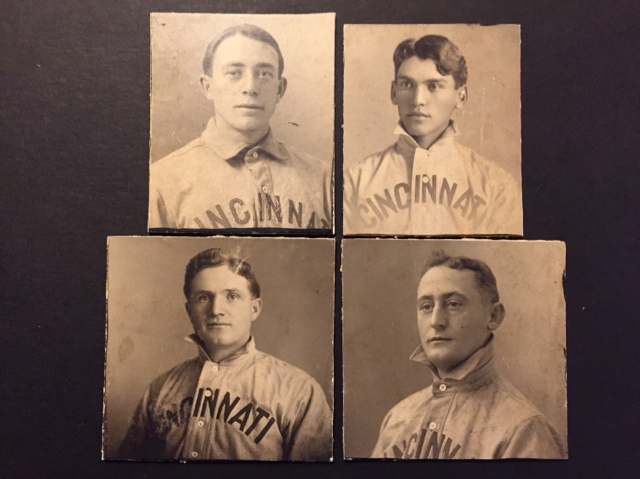 Looks like the 1906 Cincinnati Reds. 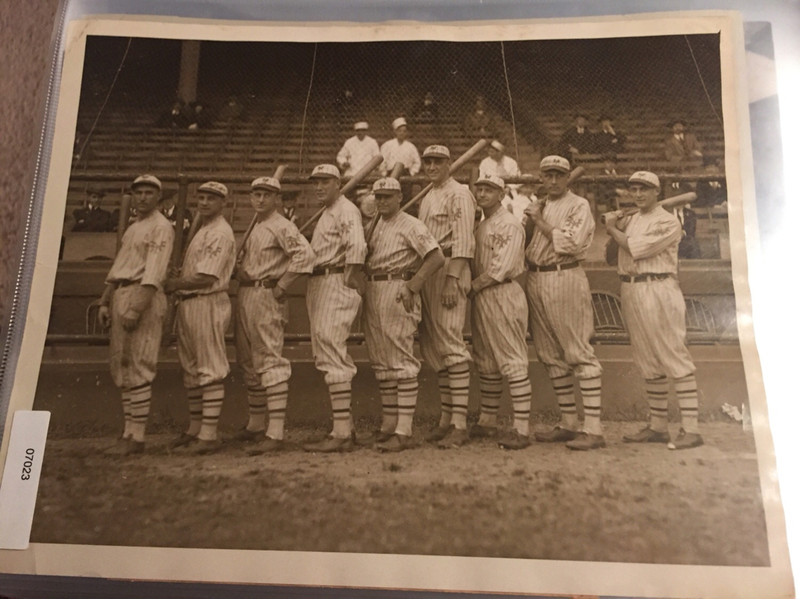 Did anyone here happen to win lot #98 with all of the Cuban baseball related photos? I guess you could say this Home Run Baker Photo was double-buried. After a week of pouring over our photos, under the “Sport Pictorial” sticker we discovered the always welcomed Paul Thompson stamp!